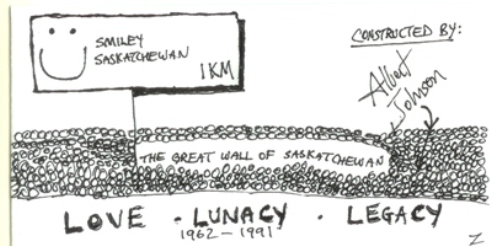 Just outside of Smiley Saskatchewan is the Great Wall of Saskatchewan. 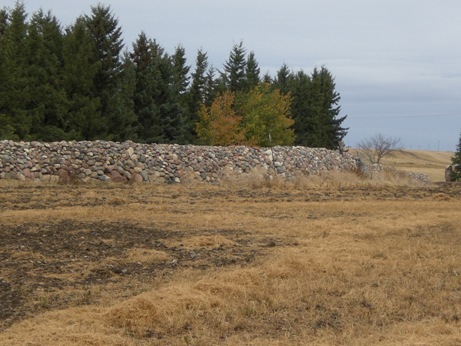 This is a project of love, legacy, and tenacious obsession on the part of Albert Johnson who spent 30 years building the wall. Check out this short 10 slide story I created about Albert Johnson’s wall. To view the 10 slides:click here. You might not spend 30 years building a wall but when your work is done, what will you leave behind? What a beautiful story and image. I think we forget sometimes in the apparent complexity of knowledge work about the underpinnings of what is good labor. It’s easier to see the value of the stones that make a wall, and to imagine each one of the stones, how it is placed and balanced; the talent of the wall-maker and that person’s dedication. Sometimes we forget that each project, each relationship, each moment to moment transaction today is like one of those stones. Perhaps we can no longer drive along a road to see how they’ve accumulated into a monument; yet to my mind they are no less real for being subjective products. Maybe there’s just a thin file folder someplace lost in a cabinet in the basement, but it represents years of personal work, now more or less invisible. The beauty of such a legacy is that in some way it is like those zen poems written on old pieces of newspaper into which a fish had been wrapped. The poem was sent on its way in the universe with only an expectation of its transience. It dissolved within a few hours of having been written, or was crumbled up and tossed in the fire. In another world, we could build a wall from stones; today, we type words onto a screen — and all that washed away much faster even than footprints next to a wave. Yet, God love us, we keep making our marks and investing our hearts in our accomplishments, even, perhaps, just delivering the mail. Tomorrow there will be more, and after that there will be more, and so on and so on. And yet we do know the difference between mail delivered well and not delivered so well, and we take pride in it, all of it, because the heart knows good work, and no matter what it is, no matter how evanescent, the beautiful thing is just that we care. And that makes all the difference in the world. I will need to read this comment a few times. It is so rich in meaning and acknowledgement. I do have some of those file folders in my basement…I never knew you got into my house. Thank you so much for this comment, it enriches my time at the WALL.